Establish an agreed upon form of communication. We use a Secret Facebook Group. We can cast votes, plan events, and upload documents. I have one friend who is not on Facebook and I have emailed her once we decide on date, and she communicates to the group through me. Find a location. I have been thankful that I have been to be able to reserve our church building for free so that no one has to have stress of prepping their house.The beauty of the Swap is there isn't any clean up, and very little set up, since all the cooking is happening at the members' respective homes. As host, I usually get there 10 minutes early to set up tables, set out blocks for any kids who may come. Decide on guidelines for your group. For a template to get you started, you can see our Group Guidelines and FAQ's here. How many meals each women will bring? Many groups keep have each person bring the same amount of meals as people attending, but since our number fluctuate, each women brings the amount of items that you would like to bring home. For instance, if they have a small freezer that can only fit 4 freezer meals, they only bring 4 meals and leave with 4 meals. Size of meals. We just ask enough to feed a family of 4-5 people. You may want to specify things like 8x8 or 9x13 casserole pans. What types of meals are expected. Is it OK to bring freezer breakfast items, desserts, or do you full main dishes that do not need a side? You don't want anyone feeling jipped when they brought 5 lasagnas, and someone brought freezer cookies. Will you have a price point for meals? We did not, it was too touchy and I felt would discourage some people from attending. How do you want food packaged and labeled? We ask each women bring food in disposable dishes, and freezer grade Ziploc Bags. 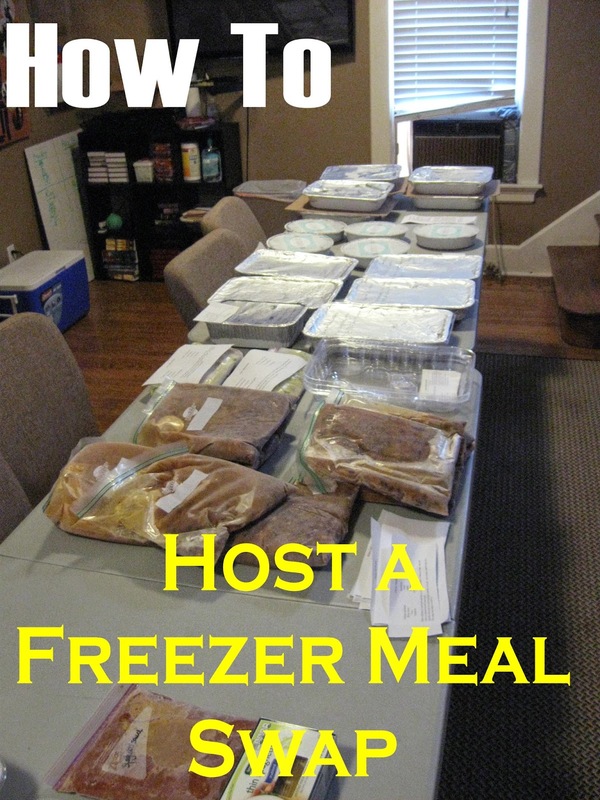 All meals must already be frozen and labeled with cooking instructions, date made, and who made it (for any follow up questions). Identify any Dietary Concerns; Food allergies, sensitivities, etc. Pick a date. We had so many people interested in a monthly swap, instead of wasting hours trying to find a time that worked for all, we have our swap the last Wed of every month. The number who attend varies from month to month, which is why the FB event RSVP is so important. Pick recipes. To avoid duplicates, each person must list on a thread what they are bringing on the Events Page when they RSVP yes. If you have dietary concerns in your group, list them in your guidelines or in a document in the FILES section of your Facebook group. Each women sets up their meals on table, with instructions beside. We each explain what we brought and any special instructions (like 'When I made it last time I served it over rice", etc). Each women draws a number from a cup. After the first person picks her first meal, the second person picks one meal. This continues until everyone has chosen their first choice of meal. They continue the rotation over and over again until all the meals are gone, and everyone has chosen the same amount of meals they brought. and don’t forget to bring your coolers! Our Group's Guidelines and FAQ's. Every member must read it and it helps us to stay on the same page. Freezer Meal Recipes that have brought to past swaps. Thanks for posting this, Robyn. Great ideas!